I kissed his nose and my tears ran down his muzzle. No matter how long I do this work I will never understand how anyone could ever hurt a sensitive, gentle, innocent little guy like Raymond. I will never accept that he could just be a furry little test-tube that labs can discard (kill) at their discretion. Beagle Freedom Project is in the business of ending animal-testing and rescuing dogs like Raymond and telling his story is our method. The more public understands the stakes by meeting these survivors, the more progress we will make. It never gets easier... that emotional punch to the gut, the heartache from witnessing these little animal-testing survivors trying to grapple with the new concepts of freedom and affection. I suppose it never should. 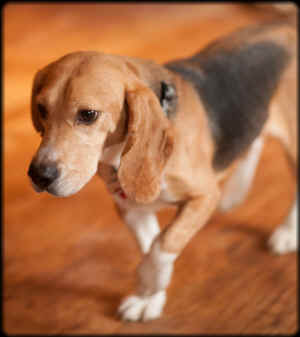 I helped organize Saturday’s liberation of 9 beagles from a research laboratory in the Midwest. In the year I have worked with ARME’s Beagle Freedom Project I have had the honor of helping in 25 different rescue missions that have saved almost 100 former research animals. I have been active in causes against animal testing for over 20 years. Yet every time I pick up a scared little survivor fresh out of a lab my heart breaks anew because their pain is just too real. Raymond did it for me on Saturday. I took him home from the rescue and the stoic mask I had worn all day crumbled. Raymond was one of the shy-guys from the group, clearly sensitive, not trusting of any human intentions, and overwhelmed with the strange new world he has found himself in. He paced throughout my home unsure of what to do – and only easing up when he saw my other beagle, Junior (from the Spanish 40). Junior wanted his distance though, clearly spooked by the memories from the laboratory stench still clinging to Raymond’s frail little body. After a bath I tried break the anxiety induced pacing by wrapping Raymond up in a blanket and cuddling him on the couch. The day’s full events combined with these new comforts of a soft cushion and a warm embrace triggered an instant sleep. For the hour he slept on my chest the reality of his trauma set in. I wanted so much to just make him better, to feel safe, but sadly know that we cannot undo the years of torment he has suffered in a couple hours or even days. His road to recovery would be a long one and he was just starting... but at least he’s got this chance though. When he woke up we were lying face to face and Raymond stared into my eyes. I can’t know what he was thinking – whether he was waiting for the other shoe to drop and something painful to happen – or if he was finally beginning to understand peace... I hope. I kissed his nose and my tears ran down his muzzle. No matter how long I do this work I will never understand how anyone could ever hurt a sensitive, gentle, innocent little guy like Raymond. I will never accept that he could just be a furry little test-tube that labs can discard (kill) at their discretion. Beagle Freedom Project is in the business of ending animal-testing and rescuing dogs like Raymond and telling his story is our method. The more public understands the stakes by meeting these survivors, the more progress we will make. On Saturday we saved other beagles in addition to Raymond. Scotty, Terri, Patty, Johnny, Paulie, Allen, Frankie, and Dayton – all named in honor of our all-star supporters in the Minnesota State Legislature who are working to pass the Beagle Freedom Bill. With their voices and votes, your support, and the inspiration of our freed beagle ambassadors we will save more dogs and we will begin to see the end of this horrible practice! Visit our webpage to see more incredible pictures. And if you have not yet made a year-end contribution please consider one now. All donations of $50 or more dedicated in honor of Raymond will come with a personal photo of this sweet guy and a card from me.